Driving a vehicle is not just a way of commuting from one destination to other, but for some it’s more than that—it’s more like an obsession. Yes, we do believe that driving is not a pleasant experience for some individuals. Well, of course because of traffic and other roadside chaos which we have to face on daily basis. But apart from that there are still a few human beings who don’t just drive for traveling, in fact they rather prefer to enjoy the overall experience of the ride too. So, if you’re one of them you’ll be glad to know that this favorite hobby of yours might help you generate revenue as well. Too good to be true, isn’t it? When we buy a car, it involves a huge investment at initial stage. In that case affording and managing a vehicle becomes a tedious task. So, wouldn’t it be great if you earn a few extra bucks while driving so that paying your new vehicle’s EMI won’t hurt that bad? 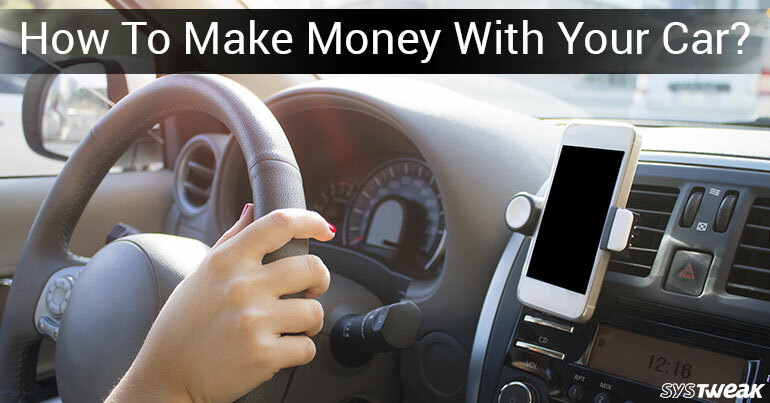 Yes, keeping all this in consideration here are a few ways that’ll help you in making money with your car. Let’s check em’ out in detail. If you like interacting with new people and don’t mind working on a steady night job routine then this is a great option. You can register yourself as an official Uber or Lyft driver and use your personal car as a taxi to drive passengers around. Yes, we understand you must be thinking that whether it’s safe or not? But not every passenger is a serial killer or ax murderer! There are some needy passenger too who await a comfortable car ride. So, if you’re ok to take this tiny risk and don’t mind couples fighting on your backseat or some silly drunk head’s leftovers then you should surely consider this option. You can sign up to be an Uber driver here, or a Lyft driver here. If you’re not comfortable with humans entering your car then this might be another option. With Amazon Flex you have the freedom to pick out blocks of hours that you want to work and pick up a set of packages. Amazon’s app will also recommend routes to optimize your delivery times. So, if you’re interested you can sign up or get more information here. There are few restaurants that support home delivery, but don’t have their own personal drivers to deliver it. This is when you jump in! If you’re interested in delivering food and don’t mind the smell of yummy dishes entering your car (the food which you can’t eat of course) then this option can give you a better pay. You can sign up to drive for DoorDash here, and GrubHub here. Shipt and Instacart are delivery apps dealing in grocery stuff. With each order, you’ll go to a supported grocery store to pick up a list of items, then drive the package to the customer. So, if you’re a seasoned shopper whose quite familiar with nearby grocery stores then you can try your luck with this option. You can sign up to be a shopper for Shipt here, and Instacart here. Last but not the least, if the above-mentioned options didn’t please you enough then you can try renting your car to others via authenticated apps like GetAround and Turo. These services let you add your vehicles to a fleet of rental cars on demand. Users can rent your car for a set number of days and pay you for the privilege. But this whole deal depends on whether you’re ok with someone else drive your little beast? Also, whether you comfortable with the fact that your car can be gone for any duration of time based on demand. So, if this doesn’t bother you much you can apply to list your car on Getaround here, and Turo here. So fellas, here were the 5 most simple ways to make money with your car. Before you think of signing up to any of these services make sure your Driving license is updated, your vehicle registration is up to date, and is insured. Sounds good? What are you waiting for? Start making money while you enjoy the ride!